A Stanford study suggests that if you simply think you are fit, you are more likely to live longer than if you actually are fit. Researchers looked at data collected over 12Ys, which included medical history, physical activity data and questions such as how active people were compared to their peers. People who "thought they were less active" were associated with a statistically significant higher risk of death at 71% more than those who "thought they were more active," after adjusting for real activity levels. 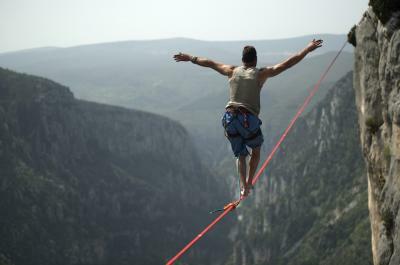 This obvious balance of mind and matter may also get you thinking about the balance of risk and opportunity. Many banks are risk-averse by nature, but a recent report from Deloitte suggests that a healthy dose of risk is a necessary ingredient for growth. While unfettered risk can be dangerous to an organization, when done strategically, banks can have more opportunities to accelerate performance, the survey suggests. Data for the survey was collected from a cross-section of 300 US-based executives. According to the survey, industry leaders are those companies that are implementing a value-focused approach into their risk strategy and using it to innovate. This group is growing their businesses faster and boosting market share. Deloitte refers to these organizations as "the implementers." Now, you may be thinking - how does this really affect my community bank? There are numerous benefits to a value-focused approach, according to this research. For starters, organizations were more apt to accomplish healthier financial and operational performance vs. competitors. Second, business leaders were more adept at managing costs and improving customer relationships that in turn, produced competitive advantages. Third, organizations felt enhanced risk protection and reputational resiliency. Consider, for example, that 48% of "implementers" say they have improved their organizations' cost-effectiveness by integrating value creation into their risk strategy. That compares with only 31% who haven't implemented such measures. The "implementers" have also been particularly effective in improving client loyalty compared with non-implementers (41% vs. 26%). Deloitte also points out that risk management, when integrated into business strategy, can help fortify customer relationships, enhance brand reputation and control costs. These are all good things for community banks. Of course, this new approach to risk begets challenges. For instance, although 88% of respondents said they recognize value creation as a key goal of their risk strategies, only 38% have successfully achieved their goal. Companies also said implementation of a broader value-focused approach was hampered by silos within the organization. This was the most frequently cited issue leading to risk-related failure in the past 3Ys. The upshot is that an enterprise-wide approach to risk is critical and community banks have an advantage here. Community banks that want to move toward a value-focused approach to risk can start by encouraging open communication between risk management and strategic planning personnel. These discussions should involve idea-sharing on the various threats and the corresponding opportunities for growth. Next, create a culture where everyone is trained to focus on risk in the context of reward. Employees need to understand that for every risk there is also opportunity. What's more, explore deploying tactics to measure risk and predict trends. Good data analytics along with human beings trained to interpret the data are critical elements for fostering a value-focused risk strategy, according to Deloitte. Data can be pulled from a wide array of sources, including employee opinion survey responses, customer behavior observations and financial performance, among other things. While many community banks understand the balance between risk and opportunity, there may be more ways to gain with little added risk. Ensuring risk and strategic management are on the same page will help by bringing everyone into this level of thinking and move the needle even more in the direction your mind and your bank want to go. After all - it is simple mind over matter. Yields slipped 2bp after Fed Chair Yellen mentioned keeping rates too low for too long could create financial fault lines and Hurricane Harvey bore down on TX in what is the biggest hurricane to hit the US in more than a decade. 1) Home Bank ($1.6B, LA) will acquire St. Martin Bank and Trust Co ($597mm, LA) for about $96.1mm in cash (20%) and stock (80%) or about 1.83x tangible book. Despite inflation below 2%, Fed President George told CNBC that shouldn't preclude raising interest rates. The Washington Post reports that 6 out of the top 10 lenders were non-banks at the close of 2016. Tight regulations after the housing crisis are seen as one of the main causes for this result. Royal Bank of Canada said they will accelerate branch closures and job cuts to facilitate progress in digital technology and cybersecurity. The Census Bureau forecasts the number of people 65+ will double between 2015 and 2055. That is a key driver why investors spent $10.2B on medical office space (10k+ sq ft) in 2016 vs. just under $4B in 2010. If the US government is unable to raise the federal debt ceiling as appropriate, Fitch Ratings stated it would be reviewing the US sovereign rating which could have "negative implications". The US currently maintains a AAA-rating with Fitch.